For the pros, this weekend represents the end of the 2017 indoor track and field season (the collegians wrap up a week later at NCAA Indoors). 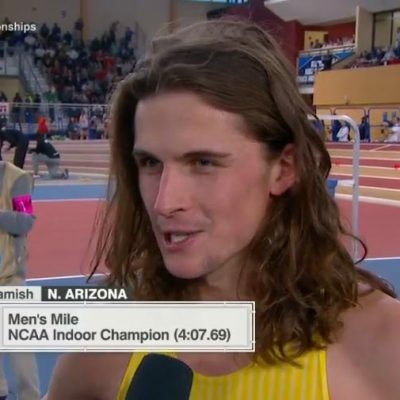 With no World Indoor Championships to qualify for, the fields aren’t as loaded as 2016, but there will be plenty of star power in Albuquerque: Cas Loxsom, Donavan Brazier, Clayton Murphy, Robby Andrews, Ben Blankenship, Evan Jager, Paul Chelimo, Ajee Wilson, Charlene Lipsey, Shelby Houlihan, Colleen Quigley are among the big names taking part. Where: Albuquerque Convention Center, Albuquerque, N.M.
How to watch: The entire meet is live on USATF.TV +PLUS (requires subscription), except for the final two hours on Sunday (5:30 p.m. ET to 7:30 p.m. ET), which will be shown live on NBC Sports Network. NBC Sports Network will also air tape-delayed coverage of Saturday’s events from 10:30 p.m. to 12:30 a.m ET on Saturday night. Two-time defending champ Matthew Centrowitz may be absent, but many of the nation’s top milers are entered, led by Olympic finalist Ben Blankenship. In addition, there are four men who’ve broken 3:55 this year plus two Olympic silver medallists. Not bad. Blankenship and Kyle Merber have delivered the two best performances from this group in 2017. Blankenship has been one of the U.S.’s top four milers over the past two years and last year made his first Olympic team, advancing all the way to the final in Rio, where he finished eighth. Though he looked a little rusty in his 2017 opener, taking 9th in the 2-mile at Millrose, he bounced back a week later in Birmingham to beat studs Ryan Gregson and Bethwell Birgen and win the 1500 in 3:36.42. He’s finished second and third in this race the past two years, but with the guys he lost to (Centrowitz and Andrews) out of the picture, he’s poised to move up to #1 in 2017. Unless, that is, Merber has something to say about it. Merber has been unlucky with injuries the last few years, but he’s strung together a lengthy block of training and the results have been outstanding. He finished third at Millrose, running a big indoor PR of 3:54.67 (just off his outdoor PR of 3:54.57) before blowing that time out of the water with a 3:52.22 at Boston University last weekend that put him #6 on the U.S. all-time indoor list. Merber is in the shape of his life right now; whether that’s enough to defeat Blankenship, who is among the best in the world when he’s on, remains to be seen. One note about Merber is that he doesn’t like altitude and Albuquerque sits at 5,300 feet. But with no prelims and a race that shouldn’t last much more than four minutes, perhaps it won’t have the same deleterious effect as a prolonged training stint. Merber has managed to work himself into great shape over the past few years but is still waiting on a signature championship performance — this is his best opportunity yet. Anything can happen in a one-off final, and as many as nine guys (Blankenship, Heath, Merber, Gregorek, Soratos, Palmer, Jager, Lomong, Manzano) will enter this race thinking they’ve got a shot to win it. Of those men, only Jager, Lomong and Manzano have ever won a U.S. title, and given that Jager and Lomong have been focused on the longer distances in recent years and Manzano has been in horrible form this year, we expect a new champion to be crowned on Sunday. We can’t totally write them off, however; both Jager and Lomong have run 3:32 for 1500 outdoors, way faster than all but one guy in this field. That would be Manzano, who is famous for raising his game in the biggest races — though we should note the last time he ran well at USA Indoors was 2012, when he won the 1500. Johnny Gregorek, who was 6th at the Olympic Trials last year, has run well in 2017, notably clocking a 3:53.15 mile PR at BU, but he’s finished behind Merber in all three of his races. Palmer, likewise, is 0-2 this year against Merber, so if an NJ*NY TC athlete is to win, our money is on Merber. A more interesting prospect is Cristian Soratos. A cult hero in 2015 thanks to his small-school roots (Montana State) and Sonic the Hedgehog socks, Soratos’ first full year as a pro last year was an unhappy one and he wound up splitting acrimoniously with the Big Bear Track Club. But Soratos returned to college coach Lyle Weese in Bozeman, Mont., last fall and at Millrose he produced the best race of his career to date: a dominant 3:54.23 victory in the unseeded heat, in which he ran the final 600 all by himself. With Soratos in that kind of shape, he could be a factor at USAs. LRC prediction: Blankenship has run well at USA Indoors the last two years and he was clearly the best miler among this group last year. His 2-mile was shaky at Millrose, but he looked brilliant in Birmingham. That run, coupled with his recent track record and Merber’s distaste for altitude, makes him the favorite. One additional factor to consider: Blankenship is entered in the 2-mile as well, so we aren’t 100% certain he’ll be racing here. If he does, he will be doubling back with about 20 hours between the events. Blankenship will face some tough competition in the deuce (Paul Chelimo and Ryan Hill), but he pulled off the same double effectively in 2015 (taking second in both events) so we don’t think it will affect him that much. But since we aren’t certain Blankenship will even race this and he’ll be a little tired Merber doesn’t like altitude, we are picking someone who loves altitude as the winner. Soratos (Montana State is at altitude) for the win. While Soratos didn’t even make the Olympic Trials last year, we know one thing. He won’t be scared. Does anyone remember this epic gutsy race when he took it to Edward Cheserek? There are several wrinkles here that could lead to a surprise victor. Obviously, altitude is one, but so is the one-off nature of the race and the size of the field. 12 guys is a lot to share a 200-meter track (NCAAs only takes 10 guys to the final in the mile), and though there are a few men who figure to be nonfactors, nine of the 12 entrants have run 3:56 or faster indoors. With that many high-quality guys, there is going to be a lot of bumping and the laws of racing say that only a few men can hold the valuable real estate just off the leader’s shoulder. With that in mind, we wouldn’t be totally surprised to see someone like Jager — who is strong but lacks the top-end speed of some of these guys — try to get out early and force the pace. A faster race plays to his benefit, and by leading he’s running the shortest distance possible. As poor as Manzano has been in 2017, a win by him wouldn’t stun us either as if he can sniff a victory, he’s always very dangerous. Who will win the men's mile at 2017 USA Indoors? *Editor’s Note: After the writing of this article, Rachel Schneider announced she has withdrawn from the meet. As opposed to the crowded 12-man men’s field, there are only seven women entered in the mile at USAs, and that number could be even smaller when the gun goes off as Eleanor Fulton is entered in the 600 and 1000 as well (Shelby Houlihan is entered in the 2-mile, but given that the races are on different days, we believe the plan as of now is for her to run both events). The race is a little tricky to predict as the two fastest women this year (and by PR), Houlihan and Bowerman Track Club teammate Colleen Quigley, aren’t pure milers and have only raced once this season. Well, you could argue that Houlihan, who was a 1500 runner in college, is a miler, but she did make the Olympics at 5,000 last year. 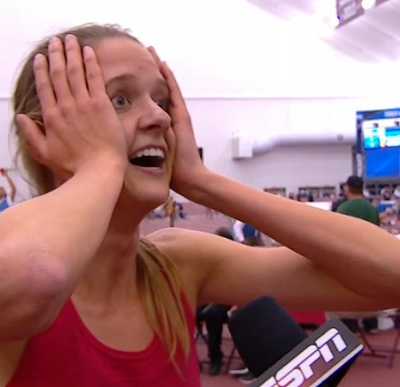 And her Twitter handle is @shelbo800. Quigley’s best event is obviously the steeple, but 4:24 is a terrific time indoors and she was third in the mile at NCAA Indoors two years ago (behind Houlihan). The point is, even if they may not be focusing on the 1500 outdoors, both Houlihan and Quigley are well-suited to the mile indoors, as their race at the Valentine Invitational showed. 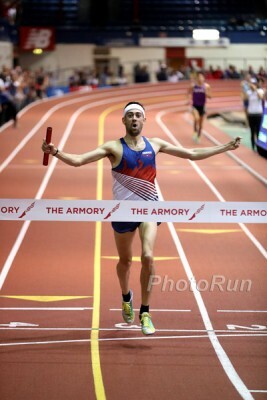 Houlihan won that one in 4:24.16, just ahead of Quigley (4:24.88), putting them #6 and #8 on the U.S. all-time indoor list. In fact, Houlihan is 3-0 all-time against Quigley in the indoor mile (the only three times they’ve raced), so she deserves to be favored at USAs as well. Of the women entered, however, only Fulton is not a threat to win this race. Schneider wasn’t that far behind Houlihan and Quigley at BU (4:25.62) and she was fifth at USA Outdoors two years ago. 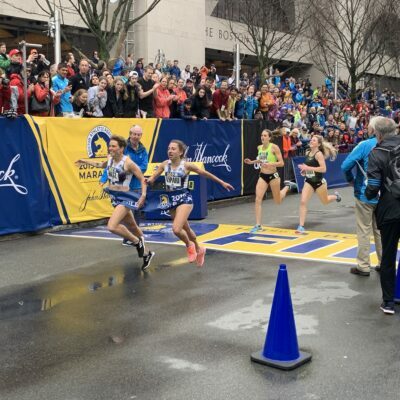 Heather Kampf was fourth in this race last year and fourth in the Wanamaker Mile, finishing only behind three studs (Sifan Hassan, Shannon Rowbury, Kate Grace). Efraimson struggled at Millrose, but she was the only woman in this field to make the Olympic Trials 1500 last year, finishing 6th at age 19. And Cory McGee certainly shouldn’t be overlooked. Her SB of 4:30.03 looks modest on paper, but it came on a flat track and is actually faster than what she ran at the same point last year (4:30.93 on a banked track), when she went on to finish second at USA Indoors and make the World Championship team. She also ran an indoor PR for 800 (2:02.20) in January, just .26 off her outdoor PR. The one negative is that she lost to Schneider at Camel City on February 4. LRC prediction: Houlihan is the fastest entrant on paper, and though one shouldn’t be a slave to times in predicting races, if you watched Houlihan’s race at BU, she looked incredibly strong over the final lap, powering away from Quigley and Schneider to win. As we mentioned in our men’s preview, altitude could make this race wonky, but considering Houlihan, Quigley and Schneider have spent this winter in Flagstaff, we don’t expect it to have a major effect. 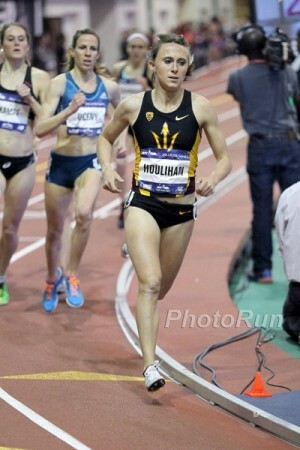 Houlihan has shown no problem pushing the pace or waiting until the final 200 in championship 1500s (though she did lose the former race), so she should be comfortable in any style of race. Houlihan FTW. Who will win the women's mile at 2017 USA Indoors?